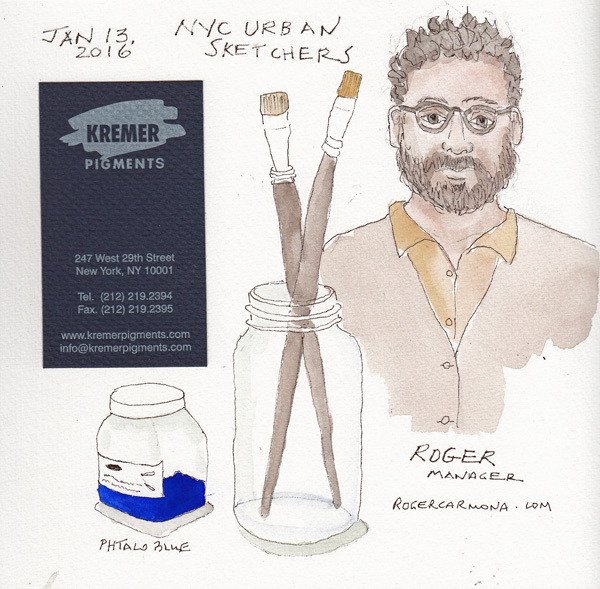 Twenty-five NYC Urban Sketchers met at Kremer Pigments (247 W. 29th St, NY, NY) on Wednesday morning for a lecture-demo by Roger Carmona, the Store Manager. Roger is an artist and an expert on Materials - specifically paints. During the first hour he told us about many pigments and how they are created: mineral, earth, plants, animals, and synthetic. They have samples of the many rocks that are ground to make pigments, including the very expensive lapis lazuli and the unbelievably expensive purple pigment made from mollusk shells. 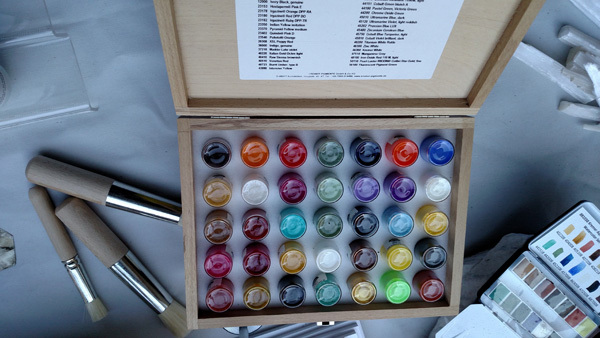 Kremer, a German company, makes pigments and mixes them with various binders to make many types of paint. 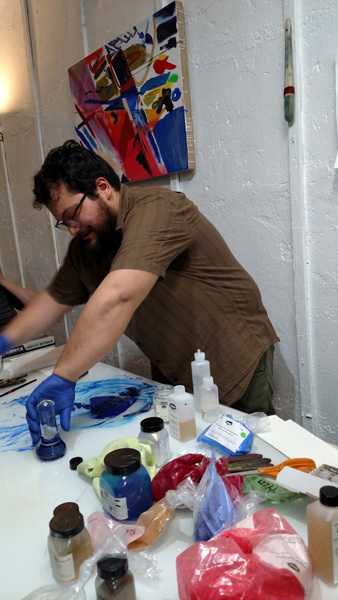 During the second hour we watched Roger mix 2 blue pigments with watercolor medium (gum Arabic/glycerin/honey) all the while continuing the lecture and answering MANY questions. The store sells the pigments, binder mixtures, and ready made paints in tubes and pans and I am dangerously oversimplifying what I learned. The blue paint on my sketchbook page is the mixture he made of French Ultramarine and Phthalo Blue. After lunch with my artist friend Benedicte, the two of us walked to The Rubin Museum of Art because Pat told us we had to see two exhibits there. The first was Becoming Another: The Power of Masks. 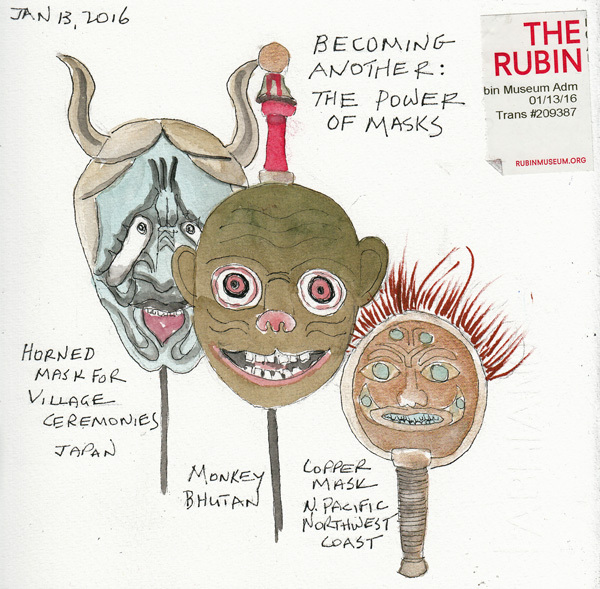 The masks, which come from parts of the world represented at the Rubin, were beautiful and each mask came with a story. Benedicte and I separated to sketch our favorites. The Monkey mask was my favorite. His job in the annual monastic festival dance of the dead is to put black and white stones, for bad deeds and good deeds, on a scale to determine which weighs more when the God of Death is judging a sinner versus a pious man. Strips of colored fabric are put on the pin on the top of the mask - and hang down covering the back of the head. 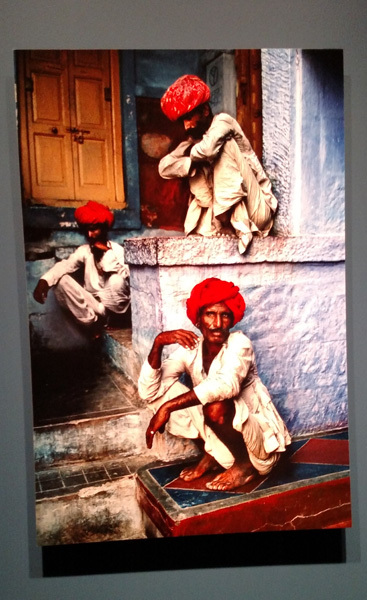 The second "must see" art was a photography exhibit by photojournalist Steven McCurry - part of his extensive India series. This was one of my favorite photos - I really want to sketch these men in their unusual positions. The website has more photos and terrific short videos by Steven McCurry.